The theory goes that the emergence of best practices and value-based reimbursement will discourage the practice. Might the conversation evolve as best practice strategies begin to emerge? What can organizations do to adapt documentation practices, and will the shift toward value-based reimbursement help steer the industry in the right direction? As organizations have implemented EHRs, rates of copy-and-paste documentation have remained high, according to a special report published by the ECRI Institute that recently evaluated 13 studies examining the frequency of copy and paste. Though the studies don't distinguish between appropriate and inappropriate use of copy and paste, it's obvious that the functionality causes problems for hospitals and physician practices alike, says Lorraine Possanza, DPM, JD, MBE, director of the ECRI Institute's Partnership for Health IT Patient Safety. Jon Elion, MD, FACC, president and CEO of ChartWise Medical Systems, agrees. "We're drowning in data and thirsty for knowledge," he says. "It's very easy when you write a note to automatically include lab data, medications, problem lists, allergies—and you've generated a note that's five pages long before you've written one word." 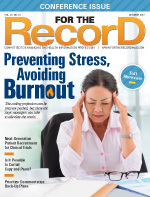 Cynthia Nicholas, MSA, RHIA, CPHQ, CHC, vice president of coding, audit, and compliance at Atos Digital Health Solutions, says problems with copy and paste seem to be at an all-time high, with much of the problem driven by medical necessity. Once physicians identify the buzzwords payers require as a prerequisite for payment, they tend to use that language repeatedly without tailoring it to each patient's unique clinical presentation, Nicholas says. In fact, a high percentage of unrecoverable medical necessity denials may be the first sign that an organization has a problem with copy and paste, she notes. An adverse event such as a medication error in which a patient receives the wrong medicine or the wrong dosage due to inaccurate documentation is another sign of potential copy-and-paste issues, says Ann Meehan, RHIA, director of information governance at AHIMA. Without these clues, organizations could struggle for years with inappropriate use of copy and paste without even knowing it, she says. An inability to monitor the use of copy and paste continues to perpetuate the problem in many organizations, says Meehan, who previously worked as the vice president of HIM at a large integrated health care delivery system. During her time there, internal IT professionals tried to develop reports that would query individual records to identify repeated text phrases. Meehan says the reports, many of which were hundreds of pages long, required manual review and often led to false positives. Without vendor support, trying to monitor the use of copy and paste was virtually impossible, she adds. Although copy-and-paste documentation may increase efficiency for physicians, it tends to do just the opposite for coders, abstractors, auditors, clinical documentation improvement (CDI) specialists, release of information specialists, and payers. For coders, the challenge is the overwhelming amount of documentation that must be reviewed, Nicholas says. Coders must wade through everything—even when it's obvious that the documentation has been cloned—because there could be one line or phrase that's unique to the patient that could affect code assignment. Besides being onerous, this process puts coders in the difficult position of having to scour information and/or query physicians, Nicholas says. It's also difficult for vendors and managers to set productivity standards when they know records with cloned information take longer to review. Nicholas says there could be as much as a 20% decrease in coder productivity for a complicated inpatient case when a significant amount of documentation has been copied and pasted. She frequently sees cases for which admitting physicians pull the entire emergency department (ED) record into the patient's history and physical. Specialists subsequently continue to pull this information forward throughout the record, including into the discharge summary. "You end up with a 99-page discharge summary because all they've done is copy and paste everything from the entire stay into one document instead of trying to summarize and be more specific," Nicholas says. This not only affects coders but it also makes physicians particularly vulnerable during malpractice lawsuits when attorneys could feasibly find critical clinical information buried within the documentation that a physician overlooked because he or she copied and pasted the information without ever reading or validating it. In its special report, the ECRI Institute highlights several particularly egregious examples of how copy and paste posed real risks to patient safety. For example, a patient who presented to the ED with atrial fibrillation and potential heart disease was discharged to his primary care physician. The physician failed to diagnose cardiac disease and instead copied the same assessment and plan over 12 office visits during the next two years. The patient died from a heart attack, and the physician was successfully sued. Another example involved an infant for whom the initial EHR note specified no history of tuberculosis (TB) exposure despite recent travel to a TB-endemic country. Subsequent office visit notes included copy-and-paste documentation related to the negative exposure to TB until two weeks later when the child was diagnosed in the ED with TB meningitis, leading to significant residual deficits. Other consequences may be less clinically severe but nevertheless cause significant inconveniences for patients. For example, consider a patient who reports a family history of cancer. When this information is incorrectly listed under the patient's past medical history—and subsequently copied forward without validation—a life insurance company could accuse the patient of deliberately withholding information about a preexisting condition. Meehan says there's also the issue of HIPAA violations that could occur when physicians copy sensitive personal or clinical information from one patient's record into another—and then that information is released. Other consequences may not affect patients directly but could raise a red flag with payers, she says. For example, when payers see the exact same vital signs and physician observations over the course of several days or a week, this could prompt a closer examination of documentation that could lead to denials. Deborah Grider, CDIP, CCS-P, CPC, CPC-I, CPC-P, COC, CPMA, CEMC, senior health care consultant at KarenZupko & Associates, says payers know that copy-and-paste documentation can artificially inflate evaluation and management levels, which is why they're beginning to request records for multiple dates of service to determine whether the review of systems, for example, is exactly the same. "If you didn't really do the work, then you've submitted a false claim," she says, adding that she recently audited a hospital-based physician who had to repay millions of dollars to a Medicare contractor because of cloned documentation over three years that made the payer question whether he actually performed the work. The same is true for pathology reports, Elion says. With proper attribution, physicians can—and should—copy the pathology report into their notes so coders can assign the most specific codes. In some cases, the information found in these reports can be incredibly helpful in terms of avoiding potential quality issues, Elion says. Consider an X-ray report that shows a pleural effusion. When a physician copies and pastes this information into his or her note (with attribution), coders can use this information to assign a code for pleural effusion, which excludes the organization from reporting an adverse patient safety indicator (ie, iatrogenic pneumothorax). Being able to copy and paste documentation is important in a busy health care environment, Possanza says. "Information that's already recorded in the chart has value," she explains. "There are reasons why you'd want to reuse that information. Identifying new ways to appropriately reuse information is important." Meehan agrees—with a stipulation. "I do think there's a benefit to providers in helping reduce the time they're spending in the EHR, but there needs to be protocols around it," she says. For example, the facility in which Meehan worked told physicians they should copy only information from their own notes. They weren't permitted to copy information from an older record or from another patient's record. The organization also didn't allow physicians to copy vital signs. The good news is that emerging health care initiatives focusing on high-quality, low-cost care may illuminate the need to address copy-and-paste documentation more directly. That's because reimbursement will depend on an organization's ability to contain costs, Nicholas says, adding that copy and paste often increases health care costs due to the duplication of services. "There's a good chance that physicians are going to reorder tests or redo exams because they don't have that trust in the documentation," she points out. Grider agrees that while meaningful use may have caused providers to rush into EHR deployments and develop bad habits, the Medicare Access and CHIP Reauthorization Act of 2015 and other value-based initiatives will likely inspire them to take a step back and examine how their documentation affects quality of care. Likewise, payers will continue to ask this same question in the form of audits. "I think we're going to see a lot more audits that look at the quality of care, cloning, and copy and paste," Grider says. Create a policy on the use of copy and paste. Involve physicians, nurses, clinical informaticists, IT, and HIM in the creation of a policy that addresses appropriate vs inappropriate use (including specific examples), Meehan says. Can physicians pull information from a previous record? If so, what information? Can they copy information from another physician's documentation? If so, what information—and how must they attribute it? • exam or assessment portions of a medical student's note. Be as specific as possible, going beyond vague statements such as "Use copy and paste with caution," Grider says. Also be sure to extend these policies to any hospital-owned or -affiliated practices. Physicians need to understand that the policy applies all the time regardless of the setting in which services are rendered, Grider notes. Require physician compliance by including the policy in medical staff bylaws, Nicholas suggests. Grider says another idea is to tie recoupments (including those due to cloning) directly to physician bonuses and salaries. Solicit physician input. When do physicians believe it's appropriate and necessary to copy and paste information? Does this vary depending on the service line? Incorporate this information into the organization's copy-and-paste policy, Nicholas says. Provide physician education. Physicians must review and validate any information they copy and paste, Elion says. Include this requirement in the copy-and-paste policy, he adds. Physicians also need to understand the importance of tailoring information to each patient—something that often requires a closer look at the templates, Grider says. "The templates that come with these EHRs do not always provide appropriate detail," she notes. "Practices and hospitals need to go in and review and revise these templates so they're more compliant with individualizing a patient record." Involve CDI specialists. CDI specialists are well positioned to identify cloned documentation and obtain patient-specific information in real time, Nicholas says, adding that they can also help educate physicians about the dangers of copy and paste. Work with your EHR vendor. Elion says vendors should add functionality that highlights or italicizes copy-and-paste text. They should also add attribution so users can see exactly where, when, and by whom the information was originally created. This type of functionality is critical in terms of being able to monitor copy-and-paste compliance, Meehan says. Without it, organizations will continue to "spin their wheels" in a futile effort to combat the problem, she notes. Possanza says being able to easily identify the original source is helpful when physicians unintentionally truncate information by copying some but not all of it. Users who subsequently review that information can go to the original source for a complete summary. Look beyond physicians. Physicians aren't the only ones who copy and paste information in the EHR. Possanza says anyone with EHR access is technically able to use the functionality during the course of their daily work. This includes registration and admitting staff members, dietitians, physical therapists, respiratory therapists, and nurses, all of whom require education on the potential negative consequences of copy and paste. For more information about how to implement copy and paste safely, refer to the ECRI Institute's copy and paste toolkit, available at www.ecri.org/Resources/HIT/CP_Toolkit/Toolkit_CopyPaste_final.pdf. • Provide a mechanism to make copy-and-paste material easily identifiable. • Ensure that the provenance of copy-and-paste material is readily available. • Ensure adequate staff training and education regarding the appropriate and safe use of copy and paste. • Ensure that copy-and-paste practices are regularly monitored, measured, and assessed. • Verify the accuracy of all copied information, regardless of the source. • Acknowledge the original source of copied material. • Edit extraneous or redundant information that could obscure important clinical information. > History of present illness: Copying should be discouraged if not prohibited. > Past medical history (also family history, surgical history): Copy-forward with verification acceptable. > Test results: Copy-forward with auto-population of latest results acceptable. > Review of systems: Avoid copy-forward from another provider's note. > Physical exam: Avoid copy-forward from another provider's note. > Assessment and plan: Avoid copy-forward from another provider's note.